I got a disturbing email from the Columbus Metropolitan Library system this afternoon. It wasn’t about fines, or overdue books, or anything like that. 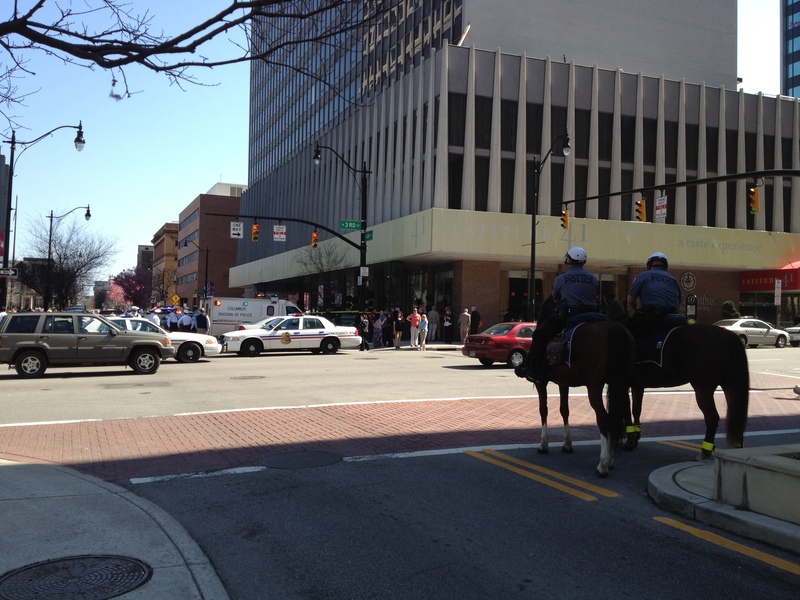 Instead, it reported on a shooting that occurred at the Main Library yesterday afternoon. According to the Columbus Dispatch, there was a dispute between two guys in the study area on the second floor of the Main Library. The second floor is a very nice space that is one of the recently refurbished areas that I reported on last summer. The article reports that the two guys exchanged words, then one guy pulled out a gun and started shooting. The other man was shot in the ankle and limped away, being chased by the shooter, until the shooter surrendered to library security. He eventually was taken away by police. A shooting, in a library? How sad, and also disturbing, too. Main Library is my nearby library branch of choice, because it has the greatest selection of books on the shelves, and I enjoy browsing and seeing whether anything strikes my fancy. Main has always been a bit gritty, with more than its share of apparent homeless folks hanging around inside and outside, but a shooting? That raises grittiness issues to a whole new level. This is the kind of thing that many of us find unnerving about the prevalence of guns in our culture. Two guys are sitting in a library, they start to argue, and suddenly things escalate out of control — and because one guy had a gun, he skipped the physical brawl step and just started shooting. Weapons are barred in the library, but obviously that didn’t make a difference. Fortunately, none of the other people who were in the library at the time got hit. And I can’t help but think that, if Russell and Emily weren’t around, I might have been walking past the area where the confrontation occurred at the moment things spiraled into chaos. I’ll continue to use Main — at least, I’m pretty sure I will — but I’m not going be able to enjoy the same kind of leisurely strolls through the shelves that I have enjoyed before. I’ll keep a wary eye on everybody, and I’ll be looking to get in and out quickly. Who knows whether that guy reading Sports Illustrated over there might be packing, and have a short fuse, to boot? Okay I have to admit it – I have been obsessed with the Trayvon Martin shooting after listening to the 911 tape (below) on You Tube where you can hear someone screaming numerous times for help, then gun shots, then silence. Each morning I wake up and the first thing I google is the Trayvon Martin shooting. Brief details as to what happened on February 26, 2012 – Trayvon Martin a seventeen year old was a guest at the residence of his fathers girlfriend who lived in Sanford Florida. Trayvon went to a convenience store at 7:00 pm to get an iced tea and skittles. When he returned to the gated community George Zimmerman a neighborhood watch coordinator for the condo association took notice and placed a call to the police department reporting suspicious behavior on Trayvon’s part stating “he was walking around looking about”. During the call to police Zimmerman said that Trayvon “was starting to run and that he was going to follow him”, but the police dispatcher told Zimmerman that it wasn’t necessary and that they didn’t need him to do that because police were on the way. Zimmerman said “okay I will meet the police by the mail boxes”, but before hanging up he said “actually could you have him call me, and I’ll tell him where I’m at”. A confrontation occurred between the two, they got into a scuffle on the ground and Mr Zimmerman who had a gun shot Trayvon once in the chest and is claiming self defense under Florida’s “Stand Your Ground” law. It should be noted that a number of burglaries had taken place in Zimmerman’s condo complex in the past year or so, but there are a few things about this story that just don’t sit right with me. Is it fair on Zimmerman’s part to assume that because a person is “walking around looking about” that they are up to no good ? It was dark and raining, could Trayvon have been lost or confused as to which was the condo he was staying at. Zimmerman did his job by alerting the police, but does he have the right to pursue Trayvon especially after he’s told not to do so ? If Zimmerman had not had a gun would he still have pursued Trayvon ? When they got into a scuffle on the ground does it seem reasonable for Zimmerman to claim self defense under the Stand Your Ground law when he was the one armed with a gun and outweighed Trayvon ? If charges are brought against George Zimmerman I am hopeful that a public trial will answer some of these unanswered questions and I will be glued to court TV watching. It’s only my humble opinion, but every story has two sides to it, if charges are in fact brought against George Zimmerman then he will have the luxury of deciding whether or not it is in his best interests legally to tell his side of the story. As for Trayvon Martin, he can’t tell his side of the story because he’s dead. Those of us who work on Gay Street have been dealing with the aftermath of the stabbing and shooting incident that happened on our street on Wednesday. We’ve learned about the heroism of one of the workers in the office where the madman attacked. The worker fought the assailant, helped to save a fellow employee, and was stabbed in the commission of his good deed; he remains in critical condition in a local hospital. We’ve also heard about friends and colleagues who were in the building when the attack occurred. Two of the people at our firm were eating at the deli in the lobby when they heard a scream, saw the melee, and ran for their lives. And all of us who work in the area and eat lunch at local establishments like that deli have thought, uneasily: It could have been me. The most frightening aspect of the awful incident is that it apparently was utterly random. The lunatic was new to Columbus and had lived here, with his aunt, for only a month. He had a history of mental health problems and a criminal record. His aunt told him to move out, and that might have been what set him off. So, a paranoid, deeply disturbed individual armed with two knives found himself in downtown Columbus and went on a rampage for no rational reason, at a location that probably was chosen solely by his inner demons. It’s troubling to think that those demons could easily have selected our building instead. Today I was sitting at my desk, working through lunch, when I heard sirens wail and police cars rush down the street outside my window. A few moments later, I heard a curious pop-pop-pop-pop sound. After a few seconds I found myself wondering whether it was the sound of gunshots, and whether I should get away from my large office windows — but the thought was so outlandish that I immediately dismissed it. 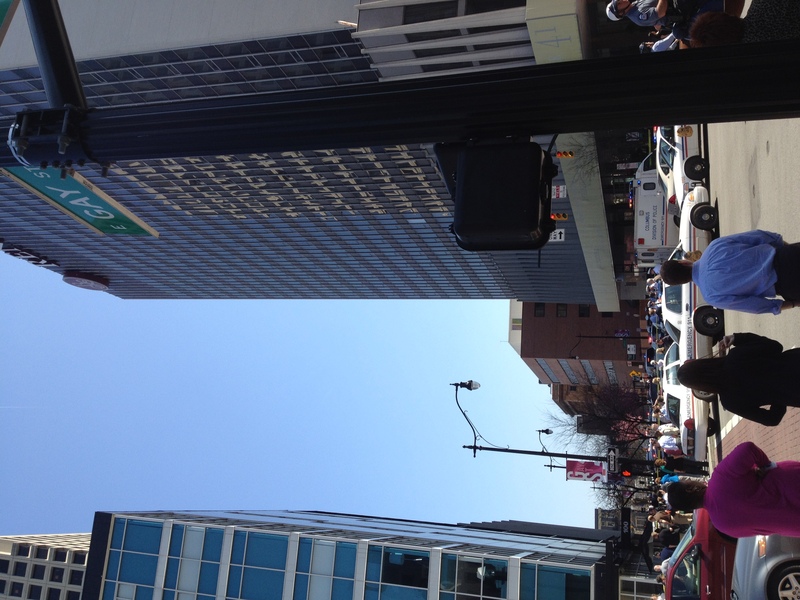 Who would think there could be a shooting on Gay Street, in the heart of downtown Columbus, over the lunch hour on a work day? But that is exactly what happened, as I learned a few minutes later when I went out to get a sandwich. The block east of our building was blocked off by police cars, the mounted police were present, gawkers were clustered, and news vans with their spiral antennae towering in the air were nearby. I heard from fellow pedestrians that the police had shot someone. It turns out that some madman entered a building a block away, stabbed a man, was disarmed, pulled out another knife and stabbed three other men, and then was shot by police who were called to the scene. Four men are hospitalized in critical condition, including the knife-wielding lunatic, and another victim is at a hospital with less serious injuries. It’s not clear whether the assailant had an understandable motive, or whether this is just a senseless, troubling, utterly random act of violence. It makes you realize that there are very disturbed people walking around out there, and you never know when you might encounter them. It also makes me think that I’ve gotten accustomed to a little zone of presumed safety on Gay Street, and that I don’t pay much attention to the other people around me on the city streets on any given workday — and I probably should. In my 54 years, I had never fired a gun — until yesterday, when my good friend Chuck invited me to join him at the AimHi Shooting Range on Route 62, just north of New Albany. 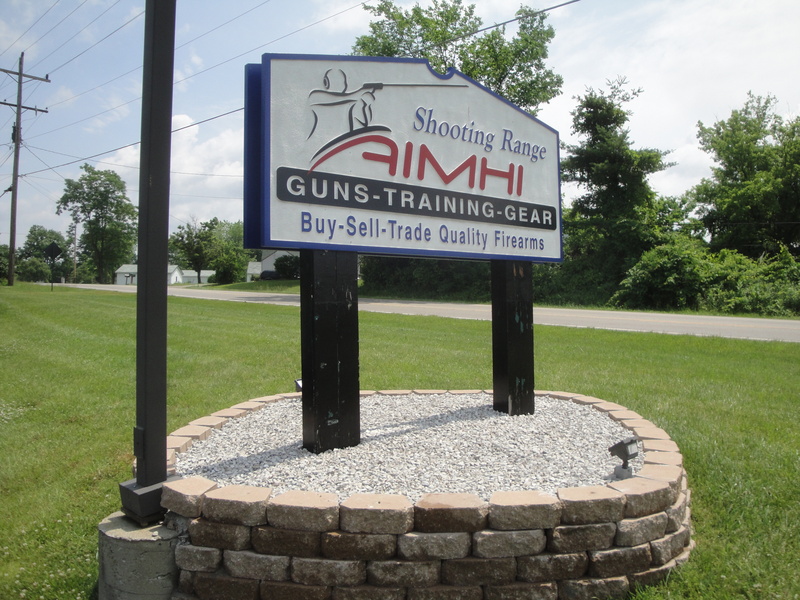 AimHi is a combination rifle range/pistol range/retail store that sells safes, guns, ammunition, targets, and other security-related items. It also offers gun training and the classes that must be completed to get a concealed carry weapon license under Ohio law. For a newbie like me, the first step is to sign in, give up your drivers license, and then watch a 10-minute safety videotape about the rules that must be followed when you are in the range — things like when firearms can be loaded, where and how loaded firearms must be placed, where to stand, and where not to go. Believe me, the thought of actually handling a loaded firearm made me pay close attention! Then, I donned my safety glasses and my ear coverings and we went out onto the range, where Chuck gave some additional instruction on how to load the guns, how to hold them, and how to aim and fire. The range looks like what you’ve probably seen on TV shows and movies with police themes. You stand in a little open booth — there were six on the rifle range, where we went — unpack your gear, and put the guns on shelves at the front of the booth, with the muzzles pointed down the range. You bring your own paper targets, attach them to clips on the target holders and use a keypad to program the distance, and the machine moves the target to the point you’ve requested. (Nazi zombies seem to be a popular target choice, incidentally.) Then you load the guns in the booth, take your stance, and begin firing. It was loud — I mean loud! — in there. If you’ve only seen guns fired on TV and in the movies, you don’t realize how much noise they make in a closed space. For some of the guns, hot bullet casings come springing out with each shot and litter the floor with bright, shiny metal, and firing the guns produces a distinct smell, too. And, of course, when you are shooting you feel the kick from the gun, and you are focused intensely on handling the gun correctly and trying to hit the center of the target. 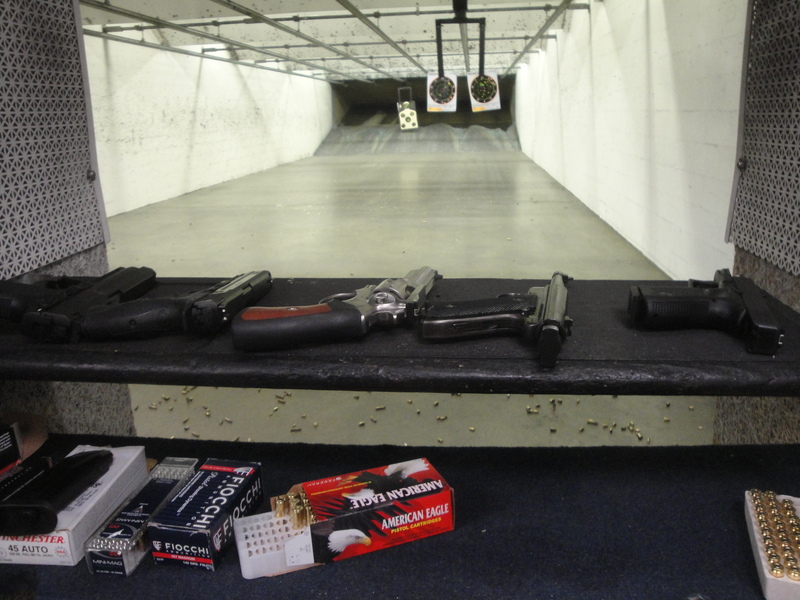 In short, going to a shooting range is an adrenalin-filled, sensory-rich experience. 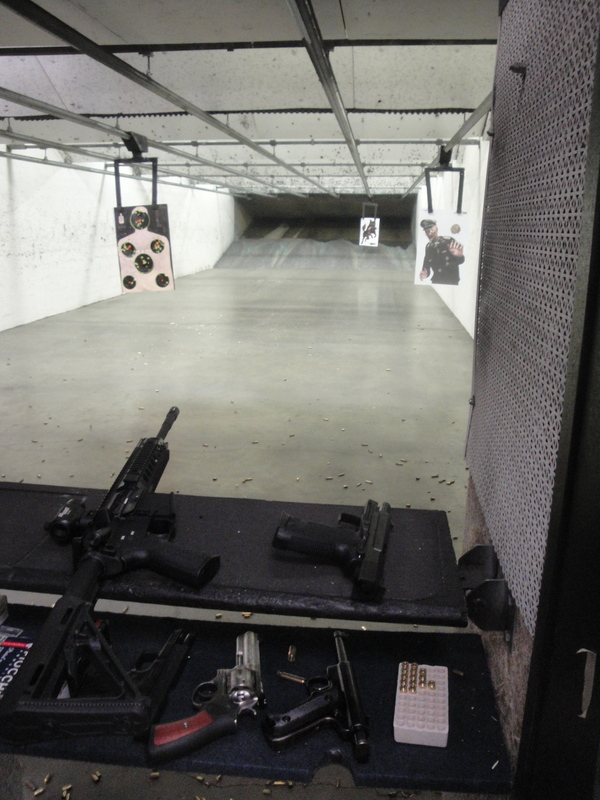 We shot .22s, .45s, .357s, 9 millimeters pistols, and a kind of assault rifle. One of the guns had a laser sighting, which was a little embarrassing, because it shows all too visibly how unsteady my aim is. As we experimented with the feel and accuracy of the different guns, I couldn’t help but notice the other folks on the range. If you think about it, you are placing a lot of trust in your fellow range-users, who could just step back and plant a slug in your gut. But the people on the range were careful and serious, and all were darned good shots. One appeared to be a policeman engaging in some target practice, another was ex-Navy, and a third was a marksman shooting what looked like a long sniper rifle and putting shot after shot into a hole on the target that was about the size of a quarter. I chatted briefly with the ex-Navy guy, told him it was my first time firing a gun, and complimented him on his marksmanship. He grinned and said he thought shooting was “therapeutic” — and I knew just what he meant.